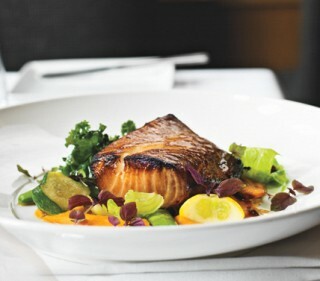 Restaurant E18hteen’s caramelized black cod with coconut-carrot purée. Photo by photoluxstudio.com/Christian Lalonde. Matthew Carmichael has a way with his ingredients that makes it seem as if he has employed magic to will them into submission. I hope he never reveals his secret; that is so much of the pleasure of eating his food. In his hands, fish behaves like tempered chocolate, melting on the tongue and blooming with hidden flavours. Braised crispy octopus with dark, drippy honey is a mesmerizing appetizer. Fork-tender chunks have a hit of spice and are a satisfying chew. A fixture in the trendy ByWard Market, E18hteen remains unapologetically fashionable and expensive. Plates are not particularly balanced, but that’s not the goal. The seasonal vegetables appear like a farmers’ market stall in miniature: a few corn kernels, a few fresh green peas, a leaf or two of sautéed chard, a few tender turnips, and a pair of snap peas. Everything is lovely, of course, each one tasting of itself, but the plate seems to say, You are not here to eat your vegetables. Instead, it’s merely intermission before submitting to the big moment of satisfaction. This is a meal that teases and tantalizes; it is sensual food — voluptuous, creamy, silky, and moist. It is served in a timeless, cultureless, placeless space — looking around, you could be anywhere. In that sense, eating at E18hteen is almost an out-of-body experience: the food and decor conspire to usher your senses inward rather than out. 11 York St., 613-244-1188, www.restaurant18.com.